Ella Wheeler Wilcox was born November 5, 1850, in the village of Johnstown, Rock County, Wisconsin, (not in Johnstown Center as sometimes stated.) Her parents were Marcus H. Wheeler, and Sarah Pratt Wheeler, with three older children they had followed, "Grandsir Pratt" from Vermont in 1849. In the spring of 1852 the Wheeler family settled in Dane County, Wisconsin and in 1853 were at home on Section 2, town of Westport, where Ella grew up, in the home where she made her reputation as a writer of appealing poetry, until her marriage in 1884, when she went to Connecticut; from which state her Grandfather Wheeler had migrated to Vermont years before. Her education was acquired in a district school, now named Ella Wheeler Wilcox School, except one short term at Wisconsin University, which was as she saw it a "waste of time." Riding horseback, dancing, visiting girl friends, dreaming great dreams and being kind, was better than trying to master mathematics, of which she had a "holy horror." Recently the old Wheeler home was accidently burned. With a Great Grandfather Pratt seven years in the Revolutionary War, and his wife Elizabeth Currier of French blood; a Grandmother named Conner; a Mother, who, like most of her aunts and cousins, was addicted to the habit of composing verses, Ella had the inherited tendency; a regular family study of Shakespeare, Byron, Burns and modern poets all year round, 1849-50 doubtless added a prenatal influence, which formed the character of her ambition. Our mother inherited a poetic strain, a talent for versification. I recall several rhyming parodies, sarcastic verses and sentimental compositions or additions to songs of those days. One sang was of a lovelorn girl, who constantly asked "Are we almost there." She was returning home after a fruitless search for health. As the song was written, it ended thus: "The quick pulse stopped! She was almost there!" It lacked a few lines when sung to a certain tune and mother added these: "And they laid her where the flowers would spring, which oft she had sought in their early bloom; where wild birds carol and sweetly sing, a requiem o'er her lowly tomb." . . . These lines were quite as metrical, quiet as poetical as the song itself. Ella Wheeler Wilcox wrote verses which appealed to the public and never one verse strained or ungramatical, as she states in her memoirs, her first check paid for a dress to wear to a wedding, in March 1869. Her financial returns were not of importance until after 1880, though she was known and loved by thousands of readers. She wrote for the same reason that a bird sings. It was what she was made for. Her marriage was a love match, 1884. The death of Mr. Wilcox overwhelmed her, until satisfied that she had received messages from him. Then she resumed literary work, and other activities; including war work in France up to Armistice Day. A malignant growth in one breast caused her death, October 30, 1919, at her home in Short Beach, Conn.
"The art of being kind" was her religion, and she lived it every day of her life. In the years between 1865 and 1875, a strong prohibition wave was sweeping over Wisconsin. Good Tempar Lodges became numerous. T. D. Kanouse was our strong man with S. D. Hastings, H. W. Giles, Thurlow Brown and Emma Brown all in the work. A lodge met in the Plackett school house, five miles west of us, and the Wheelers were among the charter members. Many of Ella Wheeler's earlier verses were in support of total abstinence and in opposition to booze, its makers, and its venders. Fifty-six of these were published in a volume entitled "Drops of Water." Her volume entitled "Shells" contained 119 poems--more than 175 poems and the author not 23 years old. It is surprising that in no one of those early poems have I ever noticed a crudity of composition, disregard of rythme, or straining for rythme. With her to the making of books there was no end, until she collapsed. It is doubtful if anyone knows the names of all her published poems. They were a great multitude and everyone found ardent admirers--and critics. 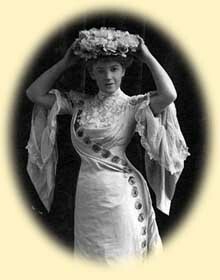 The world is better because Ella Wheeler Wilcox lived. This biography was written by the brother of Ella Wheeler Wilcox, M. P. Wheeler, Company "G," 29th Wisconsin Volunteers, Windsor, Wisconsin. But you must drinks life's gall. But no man can help you die! Through the narrow isles of pain. Wheeler, M. P. "Ella Wheeler Wilcox." Sketches of Wisconsin pioneer women. Fort Atkinson, Wis. : Hoard & Sons, [1924?]. 57-60. From the GLS Department of Special Collections reference room: CT 268 D4.